Act On File 2012 - The Authenticator Module - The Verify Signatures Functionality Verify Signatures - Easily Verify Digital File Signatures and Authenticate Files, Data and Entities. Verify Signatures - Verify Digital File Signatures. Authenticate Files, Data and Entities. This section discusses the Verify Signatures functionality of the Authenticator module. 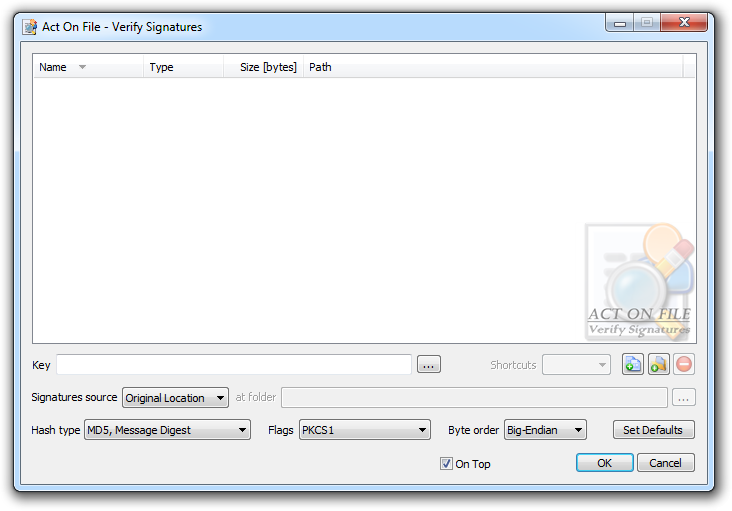 The Verify Signatures functionality is used to confirm or deny the origin and integrity of a signed file and its signature. To verify a signature, one needs the signed file, the file signature, and the authentication (public) key complement to the signature (private) key used to produce the signature. Usually the signed file and its signature would be distributed together and would be ready for verification using an appropriate public key which should have been made available through an appropriate channel. For example, the public key of an organization may be available on their website and ready to download at any time when a user needs to verify signatures and files supplied by the organization. For a detailed explanation of the principles of authentication, please view the Introduction to the Authenticator module. For an explanation about how to sign files, please review the Sign Files functionality help article. To simplify the handling of a signed file and its signature, it is possible to append the signature to the signed file. The Verify Signatures functionality is capable of verifying signatures when the signature is appended to the file using the Sign Files functionality as well as when the signature is a separate file. To Verify Signatures you need to add the files and folders whose signatures are to be verified to the selected items control of the Verify Signatures functionality. Adding folders to the selection controls makes Act On File verify all files contained in the selected folders. Any shortcuts in the selected folders will be followed or ignored according the selection in the Shortcuts combo-box. After the items to be verified are selected you need to supply an authentication (public) key, set the signatures source controls and the verification-signing controls. When ready, click OK to start the process of verification. There are four possible modes used to supply the file signatures. For modes where the signature is not attached to the file, the module will search for signatures in the appointed folder(s) and match them with the signed files by name. Signatures are expected to have the same filename as the selected file, with the appended extension ".signature". The results from the verification are displayed in a results window after the process is complete. The results dialog allows you to close the functionality, return to the functionality window and modify the verification request, and store the results in an html document. These controls are used to select and display the files and folders for the operation, and the authentication (public) key. In addition to the Add Files, Add Folders and Remove buttons, you can use the standard clipboard, drag and drop, and keyboard operations. Key Enter the path to the authentication public (or private) key. Remember to keep Private Keys safe and secret until such time as they are to be destroyed using True Delete. These controls are used to tell the module where to find the file signatures. Signatures source Select the input type and location. Appended to File Each signature is appended at the end of the signed file using the Sign Files functionality or another compatible way. Common Place All signatures are stored in the target folder and are named "[signed filename]. [signed extension].signature". Original Location The signatures are located in the same folder as the signed file and are named "[signed filename]. [signed extension].signature"
Reflecting Tree The same directory structure as that of the selected files and folders is assumed to exist under the selected target folder. Each file signature is named "[signed filename]. [signed extension].signature" and is located in the folder that reflects the folder containing the signed file. Remove signatures from verified files Set this checkbox to remove the signature after a successful verification process or clear it to keep the signature appended to the file after the verification is successfully completed. Remove signatures from failed to verify files Set this checkbox to remove the signature after an unsuccessful verification process or clear it to keep the file unchanged after an unsuccessful verification. These controls are used to control the signature interpretation and must be set to the same values that were used in the file signing process. Hash type Select the hashing algorithm: must be the same algorithm used in the file signing process or else the signature verification will fail. Flags Select the padding: must be the same padding used in the file signing process or else the signature verification will fail. Byte Order Select the signatures byte order. Different platforms may use different byte ordering. It is important that you select the correct byte order of the signatures. Big-Endian The signatures are in Big-Endian byte order. Little-Endian The signatures are in Little-Endian byte order. Set Defaults The Set Defaults is a user-friendly button that sets the Operation Controls to a default selection of properties in order to help users who might find the settings confusing. The selection made with this button matches the Set Default selection in the Sign Files functionality window. OK Commits to work and verifies the signatures of the selected files.